We at Greenskeeper Lawn Care feel the safest and most environmentally friendly way to combat insect pressure on shrubs and ornamental trees is by Deep Root Injection – a systemic insect control combined with plant nutrients. The deep root process allows for a very successful control rate. Unlike foliar spraying, root injection dose not affect beneficial insects. A sound proactive systemic prevention service once per season will protect ornamental trees and shrubs for over a year. However the uptake of the injection takes from 2 to 4 weeks prior to any insect pressure. 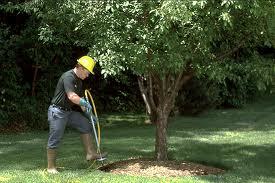 Deep Root Injection on a seasonal schedule will protect your landscape material year in and year out. Deep Root Injection service is safe for people, neighboring plants and beneficial insects because there is no spray drift. Also, unlike spraying, shrub and tree injections can be applied in windy or rainy weather.